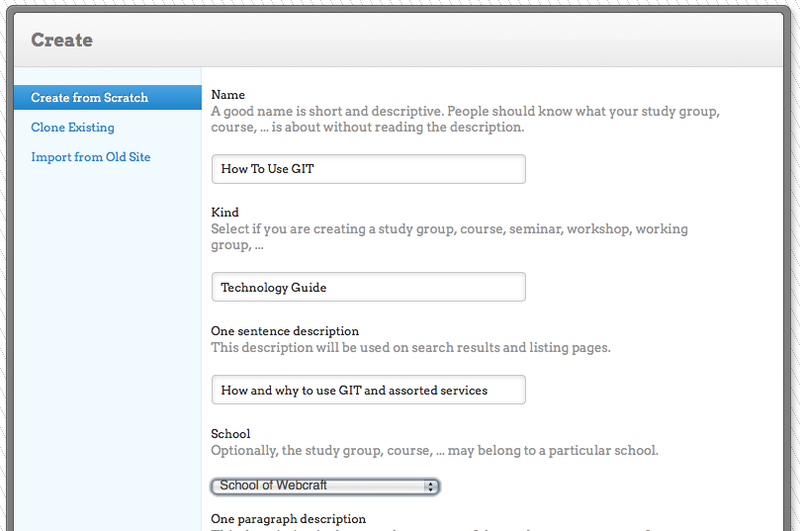 What Projects Can You Setup in School of Webcraft? If you’ve been keeping up to date with School of Webcraft and the P2PU learning community that Webcraft is a part of – you’ll have noticed a lot of changes. Not only is P2PU developing a new website that looks better and makes it easier to learn with others, we’ve also referring to different ways of learning together beyond courses and study groups. We want School of Webcraft participants to learn, teach, share and improve their web development skills in whichever format they feel is best. We’re giving you the flexibility to organise a project that appropriate to your skills, interest and schedule. Perhaps you’d like to organise a master class, a how-to or make an orientation for open source contributors? In courses one or more primary organisers, usually with more content knowledge, guide participants through a series of defined course tasks over a specific time-frame (eg. 6 weeks). Work through a course plan with a clear, scheduled end-point. Courses may be copied and re-run by either the same or different organisers. Create a course if you want to improve your skills and can commit the time to develop and run it. School of Webcraft study groups are less formal and are organised and co-facilitated by a large number of participants who want to learn about a similar topic (eg. HTML5) and who wish to help each other learn. Tasks are created and improved by the study group. There may be a recommended learning plan but participants are free to pick and choose the order of activity. Study groups have no designated end date. Study groups may endure for a long time and be organised by many different people over their life cycle. Create a study group if you want to find out more about a topic, but need other people to help you find your way. A Webcraft master class is an excellent way for a web development expert to teach experienced developers about advanced techniques but to limit it to a shorter time frame (eg. 2 x 3 hour sessions) than that required in a course. Participants critique and review each others’ work. Invite an expert to present to the School of Webcraft community. Create a master class as a way to share expert knowledge with experienced developers. The task feature of the new P2PU makes it a perfect environment for explaining how to work through a process in a series of steps. Explain a complicated tutorial made up of many different elements and to invite discussion around each of the steps. A useful how-to would be reusable by many other School of Webcraft learners. Create a guided tutorial or “how to…” if you want to make a difficult process easier to understand. One of the best ways for web developers to improve their skills is to participate in an free software or open source project, but there are often a lot of things for new participants to learn. Present project coding standards and long term goals. School of Webcraft already supports P2PU’s own Introduction to Contributing to Lernanta group and has an Introduction to Universal Subtitles group planned. We’d love to support more open source projects and provide our learners with practical skills. Create an open source introduction if you want to increase useful participation in your project and want to help people develop their practical skills. Can you think of any other ways you could learn about web development using P2PU’s great new platform? Let us know in the comments – or show us what you mean and start your project now! School of Webcraft Update – Study Groups, Badges and Derbys! Oh My!